Protect yourself against the sun and against mosquitos at once! 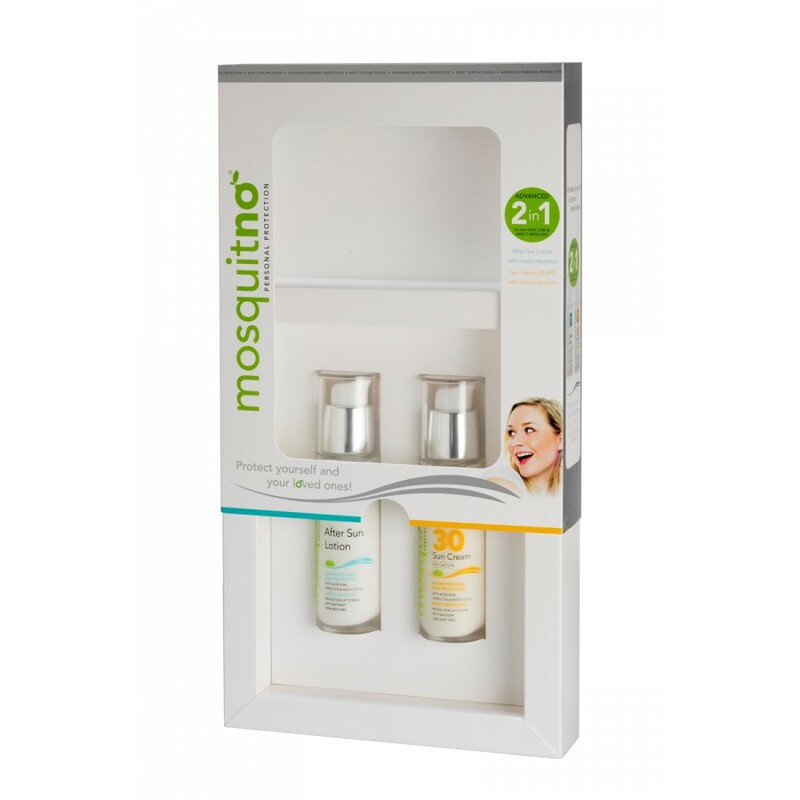 Through a joint development MosquitNo has created a new cosmetics series protecting against the sun and the mosquitoes! The active ingredient Saltidin® is used in the MosquitNo Cosmetics line. Saltidin® is as effective as DEET, but it is non toxic. Saltidin® is recommended by the World Health Organization as the best healthy alternative for DEET. 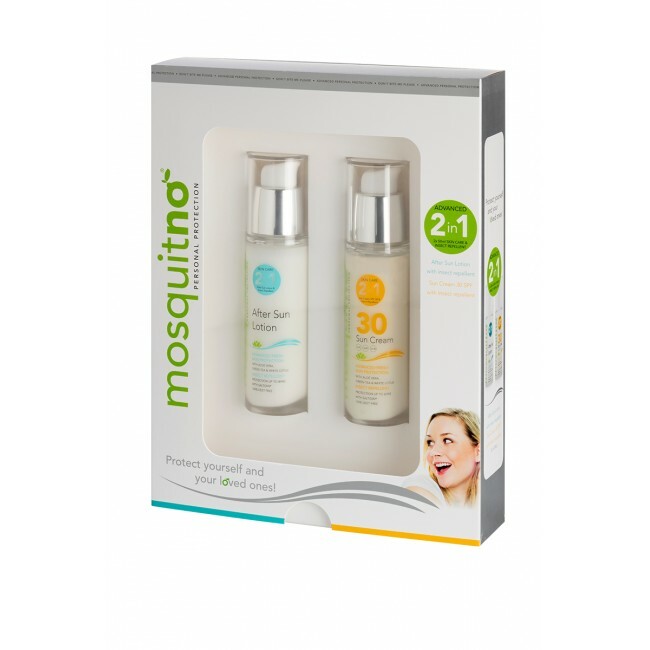 The Sun Cream & After Sun Set consists of MosquitNo Sun Cream and After Sun, both 100ml. We also offer a smaller 50ml packaging. Use the MosquitNo Sun Cream at the beach and swimming pool, during sports, cycling, hiking, backpacking and safari trips. The mosquito repellent after sun is ideal during the early evening and night, it nourishes the skin after exposure to the sun. The sun cream and after sun are safe for children from 6 months and it is also safe for pregnant ladies! No typical insect repellent fragrance! • Without typical insect repellent scent! INGREDIENTS: Aqua, Hydroxyethyl Isobutyl Piperidine Carboxylate, Homosalate, Octocrylene, Dibutyl Adipate, Ethylhexyl Salicylate, Glycerin, Butyl Methoxydibenzoylmethane, Bis-Ethylhexyloxyphenol Methoxyphenyl Triazine, Glyceryl Stearate, PEG-100 Stearate, Parfum, Titanium Dioxide (nano), Ceteareth-20, Cetearyl Alcohol, Distarch Phosphate, Aloe Barbadensis Flower Extract, Phenoxyethanol, Tocopheryl Acetate, Polyacrylamide, Aluminum Hydroxide, Cetearyl Nonanoate, Stearic Acid, C13-14 Isoparaffin, Methylparaben, Xanthan Gum, Ethylhexylglycerin, Disodium EDTA, Propylene Glycol, Laureth-7, Camellia Sinensis Leaf Extract, Nelumbo Nucifera Flower Extract, Sorbitol, Sodium Hydroxide, Geraniol, Citric Acid, Sodium Benzoate. USE: Apply generously all over your body. Re-apply frequently to maintain protection against sunburn, especially after sweating, swimming or toweling. Do not stay exposed directly to the sun too long while using a sunscreen product. The use of sunscreens is one way to reduce the dangers from sun exposure. Over-exposure to the sun is a serious health threat. INGREDIENTS: Aqua, Hydroxyethyl Isobutyl Piperidine Carboxylate, Butylene Glycol, Isopropyl Palmitate, Butyrospermum Parkii Butter, Coco-Caprylate, Parfum, Glyceryl Stearate, PEG-100 Stearate, Cetyl Alcohol, Distarch Phosphate, Palmitic Acid, Stearic Acid, Aloe Barbadensis Flower Extract, Phenoxyethanol, Dimethicone, Tocopheryl Acetate, Polyacrylamide, C13-14 Isoparaffin, Xanthan Gum, Glycerin, Ethylhexylglycerin, Propylene Glycol, Laureth-7, Camellia Sinensis Leaf Extract, Nelumbo Nucifera Flower Extract, Sorbitol, Geraniol, Citric Acid, Sodium Benzoate, Potassium Sorbate, Sodium Hydroxide. USE: Apply generously all over your body. Re-apply frequently to maintain moisturizing effect, especially after sweating, swimming or toweling. The use of an after sun body lotion is one way to reduce the dangers from sun exposure. Over-exposure to the sun is a serious health threat.